After just five days on the market, the Denuvo-protected PC version of Resident Evil 7: Biohazard has already appeared on pirate sites. Denuvo usually offers months of protection, so this is not only a record defeat but a landmark moment for the world's most famous anti-piracy technology. Death. Taxes. Immediate PC games piracy. That was pretty much the state of play before anti-piracy technology company Denuvo Software Solutions came along a few years back. With its anti-tamper system of the same name, Denuvo took the inevitability of day-of-release PC games piracy and pushed back the boundaries in a way never seen before. Indeed, some older Denuvo-protected games are still piracy free to this day. In recent times, however, the company has found itself under increasing pressure. 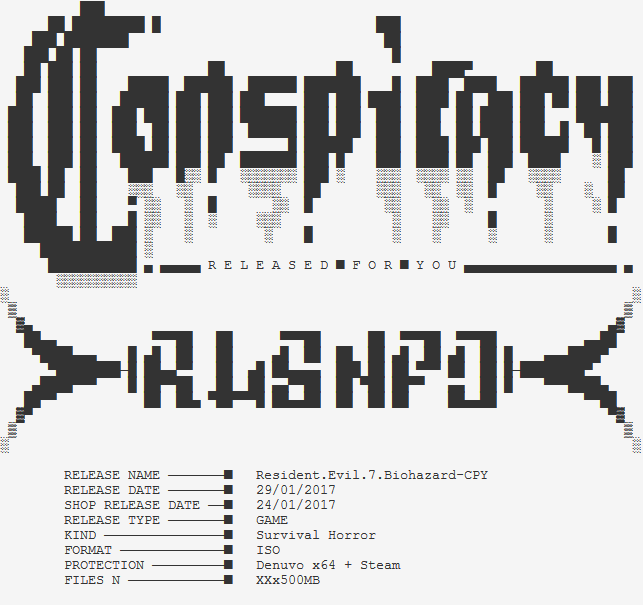 In August 2016, cracking group CONSPIR4CY (CPY) dumped a Denuvo-removed version of Rise of the Tomb Raider on torrent sites, some five months after its release. Despite the long delay, it was a landmark moment. Denuvo had been defeated. Just days later, CPY doubled down by giving puzzle-platformer ‘Inside‘ the same treatment, but in a record time of just six weeks from launch. What followed was a cascade of cracked games, including Doom, Mirror’s Edge Catalyst, Deus Ex: Mankind Divided, and Watch Dogs 2, to name just a few. Now, however, Denuvo is facing its biggest threat yet. Yesterday, just five days after its January 24th retail date, Resident Evil 7: Biohazard was cracked by CPY. The self-proclaimed Italian group placed RE7 on a so-called top site, with the ‘piracy pyramid‘ doing the rest of the work by cascading it to torrent sites in a matter of minutes. Currently, tens of thousands of pirates are grabbing the 23GB download. In its defense, Denuvo has never marketed its product as an uncrackable system. The plan, the company insists, is to give games producers a piracy-free window of opportunity, from the day of launch to some undefined point in the future. Protecting those lucrative early months from pirates is the aim. In some respects, Denuvo is still doing its job, with AAA titles such as Just Cause 3 still protected from piracy months after launch. No one but groups like CPY know why JC3 has avoided the same fate as the other titles. It could just be that they can’t be bothered to crack it. Clearly, the same cannot be said about Resident Evil 7. Denuvo is obviously a tough system to crack but less than a week’s protection is only marginally better than having no protection at all. Pirates are notoriously impatient but a sizeable majority can probably wait a handful of days for a free game, if they believe CPY can keep pulling this off. That in itself is a problem for Denuvo and the games publishers it’s attempting to protect. In December, Denuvo refuted claims that it gives publishers refunds if the protection it offers subsequently gets removed. “We can’t comment on our deals with specific customers, but we do not have any deals in place that offer refunds if a game is cracked within a specific time frame,” Denuvo co-founder Robert Hernandez said. That being said, publishers must be paying something to have Denuvo protect their titles so it’s reasonable to assume that a year’s protection must be worth more than a month. But when we get down to five days? That surely must involve some kind of discount to deter a debate over whether the protection is worth having at all.